A representative of Angel Tree shared with us her personal story of being a child of a prisoner. Her father was sent to prison for 40 years when she was only 3 years old. She recalled how difficult it was for her single mother to provide for her, and how lonely she felt without a father in her life. To make matters worse, her mother passed away when she was 12, leaving her all alone. You might think that a person in this girl’s situation would probably end up like her father…lost in life, perhaps addicted to drugs, or possibly in prison herself. But not this girl. This courageous woman moved us all to tears with the account of her commitment to finish school, go to college and obtain a master’s degree. She now has a successful career in accounting, is married to her soul mate and is helping bring awareness to the plight of children with parents in prison. All because someone was kind enough to give her a Christmas present and share the Gospel with her. This small gift let her know that she was loved and cared for, and it gave her the push to make something out of her life instead of staying in the cycle of despair and pain. I wanted to share this with you, my readers, so that you might become aware of these forgotten children. 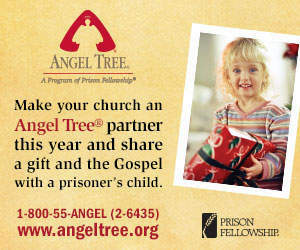 Angel Tree wants to reach as many children as they can this holiday season, and they need our help. If you are able to help, please head over to Angel Tree‘s site and donate whatever you can, or sign up to volunteer. We can really help make a difference in the life of a child with such a small amount. And if you can’t afford anything this holiday season, your prayers will also help these children in need. This looks like a wonderful program. Thanks for posting about it.